This post is sponsored by Libby's Fruits and Vegetables. 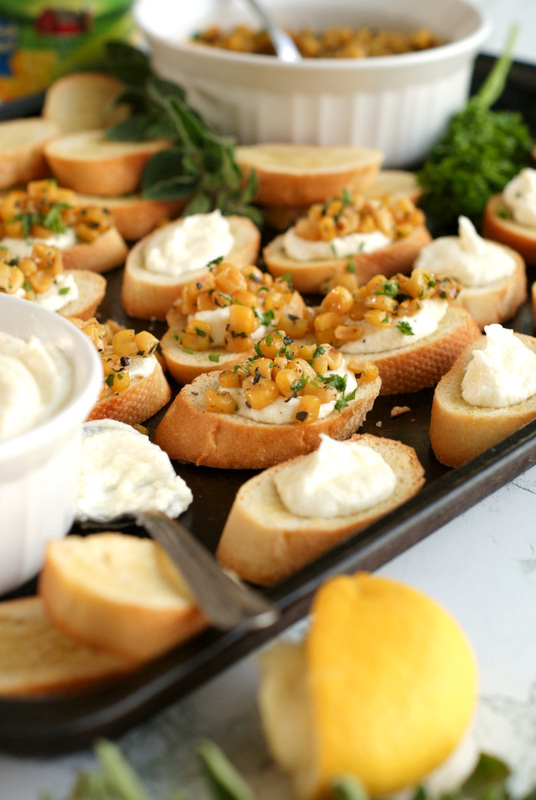 This Whipped Feta and Corn Crostini pairs pan-seared Libby's Whole Kernel Sweet Corn with salty feta cheese and fresh herbs in a delicious finger food appetizer that is perfect for parties! I am the kind of girl who looks forward to Thanksgiving all year long. There is nothing that makes me happier than inviting loved ones into our home on a crisp fall evening to celebrate the things we are thankful for over a great, epic feast. As much as I love the entire Thanksgiving holiday from start to finish, there's one little problem that I run into just about every year...I always try to take on too much when I prepare my menu. I am determined to prepare everything all by myself, and not only do it all, but I want to do it all from scratch. The natural answer to that problem, which only makes sense, is to let my loved ones contribute their own dishes to the menu to take some of the load off of me. I've done that before and, while it's lovely to let everyone bring something, I have come to realize that I am nothing but a Thanksgiving control freak. I just can't help myself! I genuinely, truly love cooking all of my favorite Thanksgiving dishes every year and I've perfected my favorite recipes for from-scratch sweet potato and green bean casseroles, homemade stuffing made with fresh herbs, and perfect mashed potatoes, hand-peeled with love. I make everything just the way I like it and I have the hardest time letting someone else make my most anticipated dishes of the year! I've come to grips with the fact that I don't love giving up control in the kitchen on Thanksgiving. What that means is that if I want to do it all, I've got to be smart about it. I've got to try to keep things some things simple. One part of the meal that leaves some flexibility is the appetizers. Now, I've said it time and time again, I am a firm believer that appetizers are a key part of any holiday menu. Giving guests a little something to nibble on while waiting for the main course not only encourages mingling and conversation, but also (and more importantly!) keeps people from getting too hungry while they wait! Instead of getting crazy fancy with appetizers, I like to stick with easy-to-make, simple, delicious dips or finger foods that don't take my attention away from putting the finishing touches on the main course. This year, I had the opportunity to get in the kitchen with Libby's Fruits & Vegetables and I've come up with a great appetizer that's prep doesn't stress me out! Yay for Cansgiving! Have you made crostini before? All you need to do is toast up some baguette slices and use them as a vessel for pretty much any topping of your choice! Simple, elegant, delicious, and party-perfect. 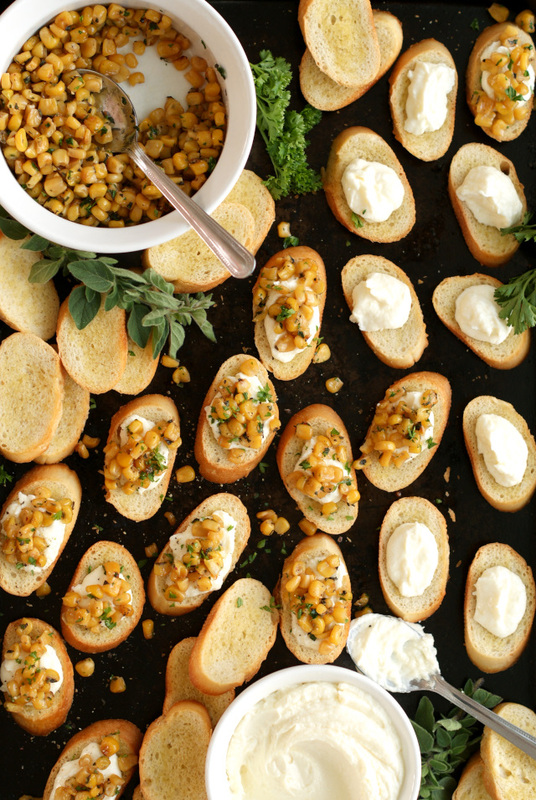 I topped this Thanksgiving crostini with pan-seared Libby's Whole Kernel Sweet Corn and a dollop of bold whipped feta. The sweet corn paired with the creamy, salty feta is the perfect combination if you ask me! I love how easily it all comes together and the crostini can even be assembled by your guests, making it the ideal appetizer choice for a host like me who has a habit of wanting to do it all. You can join in on the Cansgiving fun by entering the #Cansgiving Sweepstakes hosted by my friends at Libby's! Win one of ten $350 electronic gift cards and an assortment of Libby’s Fruits and Vegetables canned products to put towards your Thanksgiving meal this year! This year Libby's is also giving back by partnering with Meals on Wheels America, City Harvest, and Children's Hunger Alliance to help feed those in need. Each winner will pick one of the three partners of their choice, and Libby’s Fruits and Vegetables will make a matched donation to the organization selected. For full sweepstakes rules and more information visit www.getbacktothetable.com/cansgiving and don't forget to check out Libby's on Facebook, Twitter and Pinterest for more holiday inspiration! 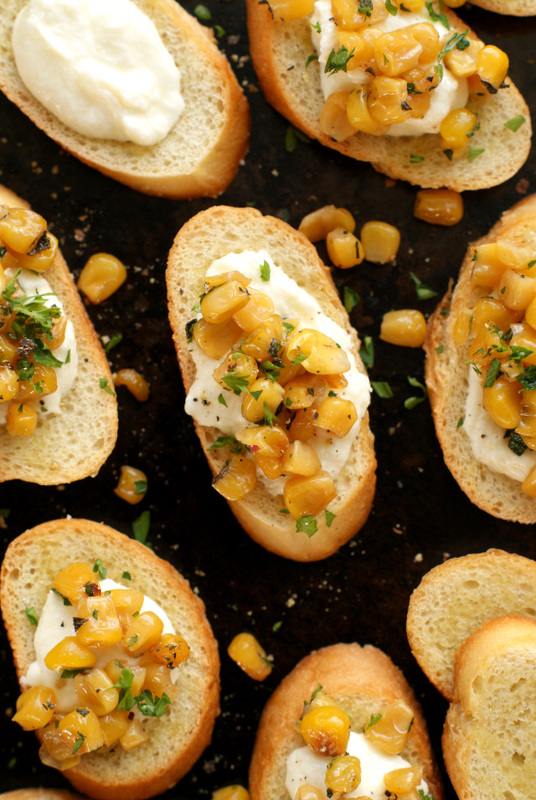 Good luck to everyone who enters and if you decide to try this Whipped Feta and Corn Crostini this year, I'd love to know what you think in the comments below. Enjoy! Heat olive oil and butter in a large skillet over medium-high heat. 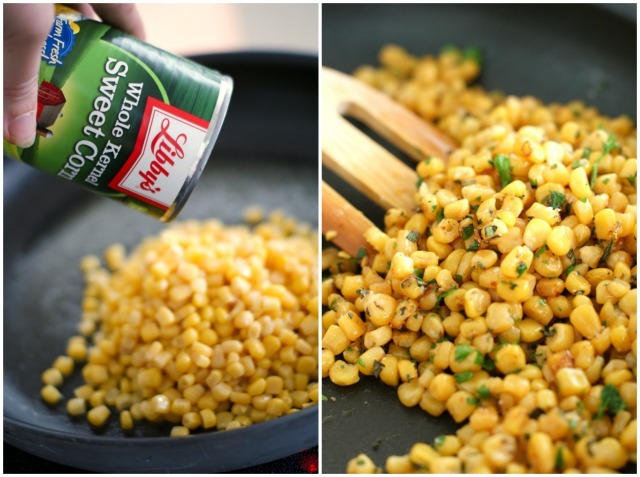 Add the corn to the pan and saute for 4-5 minutes, stirring frequently until beginning to brown. Stir in fresh herbs and transfer to a serving bowl. 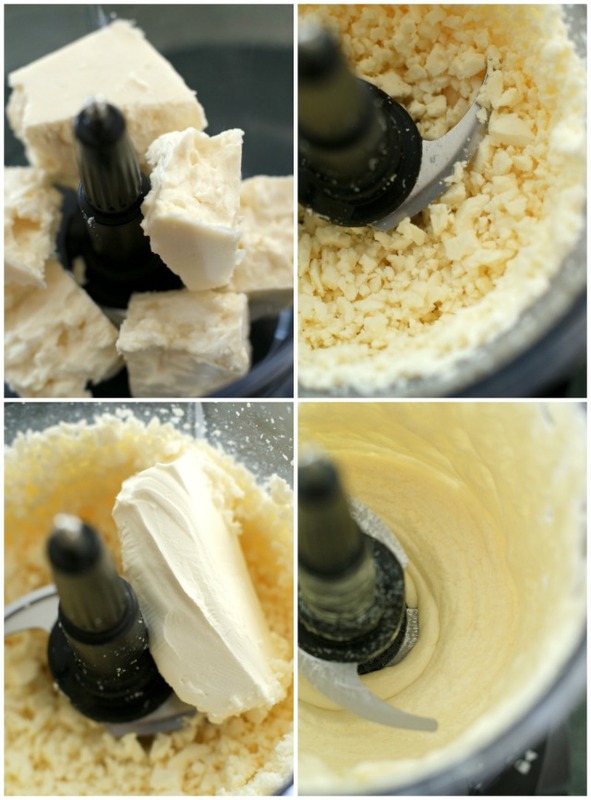 In your food processor, pulse the feta until it is in small crumbles. Add the cream cheese, lemon juice, salt, and pepper and process until smooth for 4 minutes, stopping to scrape down the sides as necessary. Transfer to a serving bowl. Preheat oven to 325 degrees. Arrange the bread slices on an ungreased baking sheet and brush with olive oil. Bake for 10 minutes. Remove the bread from the oven and immediately lightly rub each piece with the raw garlic clove. I buy my feta in a block. Crumbled feta would work just as well, though! The herbs can be substituted with any herbs that you like. Basil, chives, or thyme would be great choices. This recipe is a great choice for feeding a crowd, serving 20 people at $0.43 per serving! This post is sponsored by Libby's. All thought and opinions are, as always, 100% my own. Sounds delicious!! I didn't even know you could buy feta in a block!